February 14, 2018 By This post may contain affiliate links. Let your inner claymation artist out and have fun crafting Hognob Cupcakes using modeling chocolate. Even with little sculpting skills you can turn a piece of candy clay into a cute cupcake topper to look like this woolly Early Man character. Meet Hognob. He’s Dug’s (the movie’s main character) stone-age pet Hog. He may not speak but his emphatic growls and well-times eye rolls make him as communicative as most of the cave men he hangs around. Early Man, which opens in theaters on February 16th, tells the story of how plucky caveman Dug unites his tribe against the mighty Bronze Age in a battle to beat them at their own game and Hognob is by his side through it all. Hognob is cute, in a hoggish sort of way. With his big expressive eyes he is sure to win your heart. I was given the opportunity to make some Dug Cupcakes to celebrate the release of Early Man and I just couldn’t resist making some Hognob Cupcakes too. What’s a hero without is sidekick? Being the characters in the movie are all sculpted out of clay, I, of course, chose to decorate my cupcakes using modeling chocolate, also known as chocolate clay or candy clay. 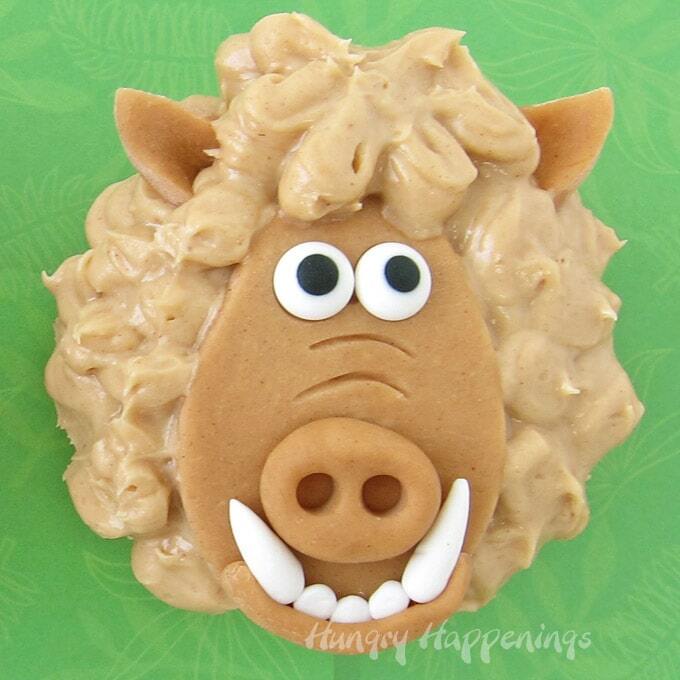 Hognob is similar in color to peanut butter so I chose to frost my cupcakes in peanut butter frosting and to make his face using peanut butter candy clay. To make the candy clay I started by making a batch of candy clay using Peanut Butter Candy Melts. I felt the color was a bit too dark so I blended the peanut butter clay with some white modeling chocolate and got the perfect color for Hognob. 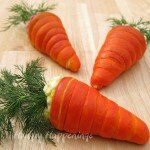 You could simply color white modeling chocolate and white frosting using a bit of brown and orange food coloring if you aren’t a peanut butter fan or have allergies. 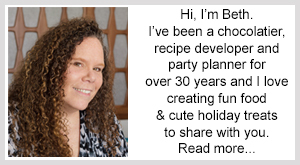 You can find the recipe to make modeling chocolate, also known as chocolate clay or candy clay, on my Chocolate Making Tips page. It’s a simple recipe that requires two ingredients. I also wrote a book all about candy clay called Candy Clay Creations. 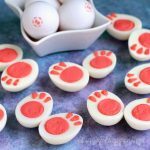 It walks you through the process of making your own candy clay, gives you tips and tricks for fixing it if it gets greasy or dry, and shares tutorials so you can make 17 cute treats. 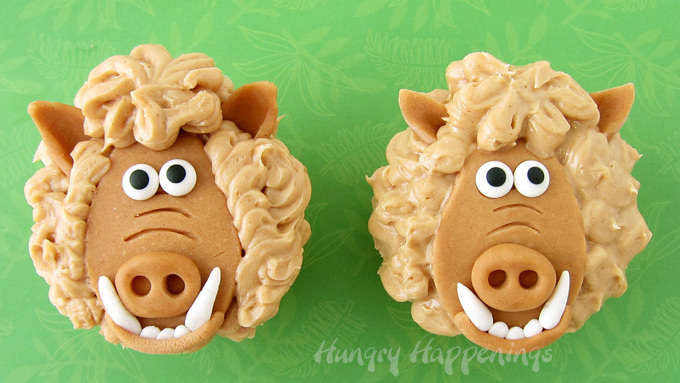 For these Hognob cupcakes, you’ll also need a small amount of white modeling chocolate for Hognob’s teeth and tusks. You can use the white candy clay along with some black to create eyes or you can simply use candy eyes. The movie characters have bulging eyes so I chose to use candy eyes on my Hugnob Cupcakes. Use a teardrop shaped cookie cutter that is slightly smaller than your cupcake to create Hognob’s head. Create an oval nose and use a wooden skewer or lollipop stick to indent the nostrils. Use a curved fondant tool or toothpick to make the wrinkles above Hognob’s nose. Attach all the modeling chocolate decorations together using clear piping gel. You can find items needed to make these Hognob Cupcakes from amazon (commission earned for sales). Peanut butter frosted cupcakes topped with a peanut butter candy clay decoration that looks like Early Man's Hognob. 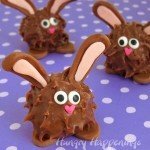 Roll out peanut butter candy clay and cut out a tear drop shape using a 3 inch metal cutter to create Hognob's head. Cut two small triangles for Hognob's ears. Pinch off a small piece of the candy clay and shape it into an oval nose. Attach it to the tear drop head using clear piping gel. Press the end of a wooden skewer or lollipop stick into the oval to create two nostrils. Roll a small piece of peanut butter clay into a thin log for Hognob's lower lip. Pinch off small pieces of white candy clay to create two tusks and 3 small teeth. Use piping gel to attach the tusks and teeth just below the nose then attach the lower lip along the bottom edge of the teeth and wrapping up around the bottom edge of the tusks. 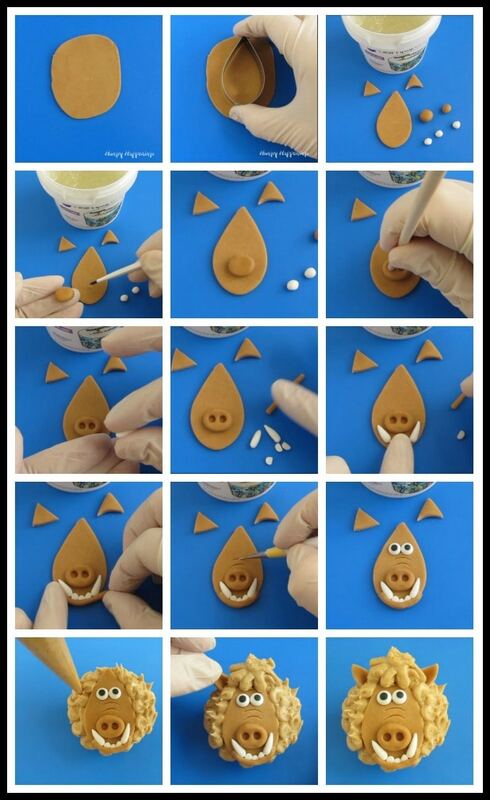 Create three wrinkles above Hognob's nose using a fondant/gumpaste tool or toothpick. 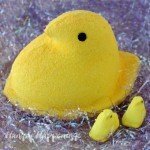 Attach two candy eyes using clear piping gel. Spoon peanut butter frosting into a pastry bag. Pipe peanut butter frosting fur over top of a cupcake. Press one Hognob head onto the frosting so that the curved edge lines up with one edge of the cupcake. Pipe on more fur and a tuft of hair over top of the pointed edge of the tear drop shaped head. Bend the triangle pieces of peanut butter candy clay into curved ears and attach one on either side of Hognob's head near the top of the cupcake. 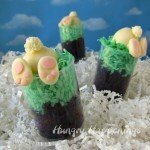 If you make these Hognob Cupcakes and share them online be sure to link back to this blog post, mention HungryHappenings and us #hungryhappenings. Don’t forget to check out my Early Man Cupcakes – How to Make Dug video tutorial too. 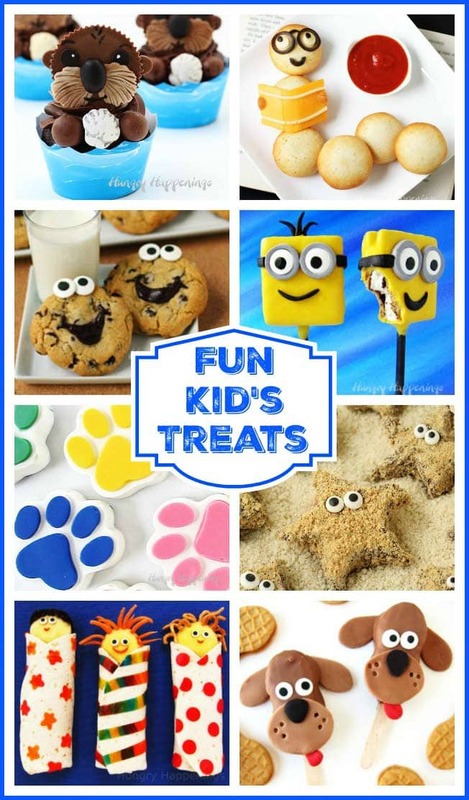 Click here to find over 100 cute and tasty kid’s treats that are as much fun to make as they are to eat! LOVE LOVE LOVE! If I am making them a few days in advance, do you think I should keep them in the freezer until the day of the party? I would not freeze the modeling chocolate. You can make the cupcakes and even frost the tops of them then freeze them. 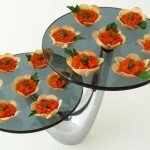 Make the modeling chocolate decoration then pop that on the cupcakes the day of your party. You’ll need to add his tuft of hair on his head, but that should only take a few minutes. Enjoy! Thank you! I’m glad you like these cute Hognob cupcakes. Our family watched this movie over the weekend and now my son want’s to have an Early Man birthday party. These cupcakes will be perfect. I just hope I can make them look even remotely close to your’s. They are amazing! How fun! I hope your cupcakes turn out great and your son has a wonderful birthday party.